Like many of my fellow lefties, I'm disillusioned with current US politics. In my view, we have a president who pursued an admirable, ambitious agenda for two years, but failed to win sufficient public support for his initiatives, and wasted too much time searching for nonexistent common ground. Now, with midterm elections lost, our president seems ready to abdicate all decision making power to the Republicans, whose ideas (in my judgment, as well as in Obama's) will actively make our country worse. Ideological (I): Fight for initiatives that are consistent with the party's core beliefs, regardless of how popular or achievable these initiatives are. Pragmatic (P): Work toward compromise and incremental accomplishments, in the view that "mixed bag" policies are better than stalemate. Cynical (C): Prioritize winning elections and humiliating political opponents over helping the country and upholding core beliefs. Either side can choose any of the three strategies, giving us nine possible outcomes. Of course, when it comes to the needs of the country as a whole, some outcomes are better than others. The following matrix illustrates (in my judgment) how desirable each outcome is for the country's citizens, on a scale of 0 (horrible) to 9 (awesome). The zeros—the worst possible outcomes—occur when cynics are allowed to set the agenda. A battle of ideologues vs. cynics isn't much better, but at least the ideologues can stop the worst of the cynics' games. Ideologues vs. ideologues is mostly a stalemate, but the ideologies may overlap enough to allow for cooperation on some fronts. If both parties are pragmatic, the country gets a solid 7. If one is pragmatic and one is ideological, the outcome depends on how successful the ideology is for the country, hence the wide range of possible values (3-9). However, politicians aren't only concerned with the needs of the country. They also want to maintain and expand their power. We must therefore also consider how the choices of the parties affect their own success or failure. 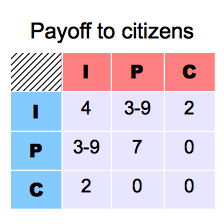 As you can see, none of the options are great for the incumbents, because whatever happens, the public will tend to (rightly or wrongly) blame them for the current problems. The best they can do is govern well. However, in a US-like system with a supermajority needed to pass any legislation, progress depends on the cooperation of both parties. 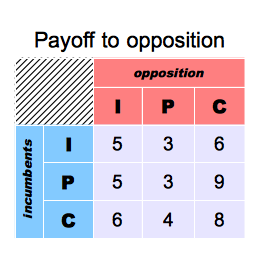 With a pragmatic opposition, the incumbents can accomplish what needs to be done, obtaining 6's. However, a cynical opposition can play the "stick in the mud" strategy and prevent the government from accomplishing anything. This is bad for the incumbents, because nothing will improve and they will still take the blame. As you can see, the cynical strategy is highly effective for the opposition party. They can stop the wheels of government and, assuming things stay bad, they are virtually guaranteed to win the next election. 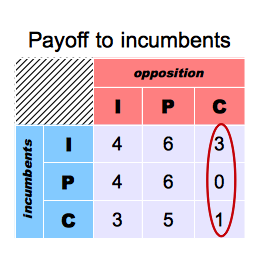 In game theory terms, C is a Nash equilibrium strategy: C is the best choice no matter what the incumbents do. Of course, "best" here means best for the party, not the country. In my reading of events, the Republican leadership has decided that C is the way to go. This strategy is examplified by Senate leader Mitch McConnell's statement that "the single most important thing we want to achieve is for President Obama to be a one-term president." There are elements within the Republican party who are more on ideological side, but I see nothing but cynicism from Boehner and McConnell. 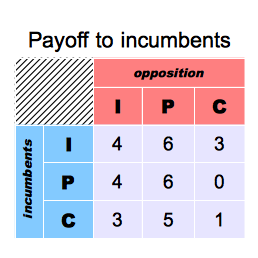 Given these options, the worst possible choice for the incumbent party is P. It's bad for the party because it sets them up to be manipulated by the cynics. It's also bad for the country, because it hands the initiative to those who would sacrifice the country's interests for their own gain. Can Democrats and Republicans sit down together and come up with a list of solutions to common problems? I think that we will be able to. I’m doing a whole lot of reflecting, and I think there’s going to be some areas where we need to do a better job. We see it also from his willingness to accept tax cuts on the wealthiest one percent of earners. The take-away message from our game theory model is this: There are times when it's good to compromise. If the other side is being pragmatic, or even ideological, compromise can be good for both the country and the party. But there's no point to playing P if your opponent is playing C! The correct response to C is I: counter cynicism by fighting for your core beliefs. Even if the cynics foil your policies, you can thwart their bad ideas and invigorate your supporters. Some democrats (e.g. Bernie Sanders) have grasped the logic of this situation. But unfortunately, our president isn't yet among them. If only the Democrats had a concise set of core beliefs, perhaps they could use this strategy. Hah, that brings up another point I've been thinking about. I don't think that Democrats are lacking in core beliefs. But they seem to be extraordinarily bad at (or afraid of) distilling and communicating them. I dunno, I think there probably are some cynical money-loving Democrats. I think one problem with your simulation is that in the real world this is a multi-move game. I don't know a lot about game theory though. You want to understand your president's failures? Look at France in 1981 with the election of a socialist president & communist ministers. Same ideas, same failures. Within 2 years they had to cut salaries & increase taxes. Lefties are good for ideas, but nothing else, you do not do any REAL work!!! Ever owned a business, paid payroll taxes every month, have only half a lemon left to eat in your fridge? @Mark- Sure, there are cynics among the Democrats. I think there are, on the whole, less cynical than Republicans, but that may just be my bias. And yes, it would be interesting to look at a multi-move extension of this model. As a mathematician, I like to start simple. But this model could be extended in many directions. @Tchaleff- It baffles me that the Republicans have managed to position themselves as champions of working people. In this latest debate over tax cuts, the Republicans wanted to keep taxes low for millionaires, whereas Democrats wanted to cut payroll taxes (which affect lower-income people and their employers). So for me it's the party of the millionaires vs the party of the working people. But clearly you see things differently. Republican governance has been bad for business since the end of World War Two. Speaking of game theory, this looks like an interesting new book. Sigmund is a brilliant and personable guy, and is also Nowak's thesis advisor. I hadn't heard of the book, but I'll definitely check it out. Democratic elections always fail to select the best leadership, which is demonstrated by a mathematical model that you as a mathematician probably will be interested to learn about. The kapuneipu SourceForge project is created to overcome this insufficiency by means of electronic communication. Sorry it seems the link doesn't work. Here it is again.